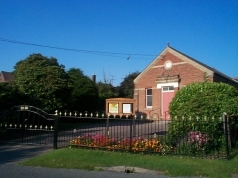 The chapel was built in 1886 and includes a school room and stables as well as a large garden. It is situated in the delightful village of Kirton, just outside of Felixstowe. It is 200 yards from the village green. The congregation, although small in number, are very much involved in the life of the village.